Sometimes there is not much happening underwater and we get bored and still have a lot of air. So we go exploring--and when we go exploring we make new discoveries. Past a sand channel, we found two coral reeflets. 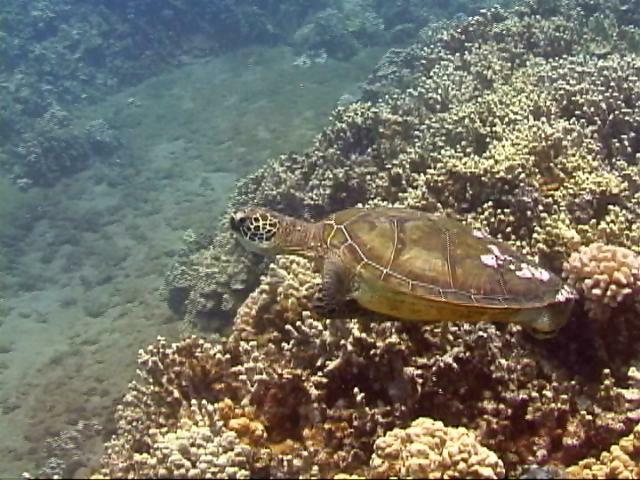 The first hosted seven honu who watched our approach with varying degrees of interest. As we kicked upcurrent and approached the second, we noticed a small turtle. We swam closer and then it became obvious. The flat carapace. The pointy beak. The perpetually surprised expression. 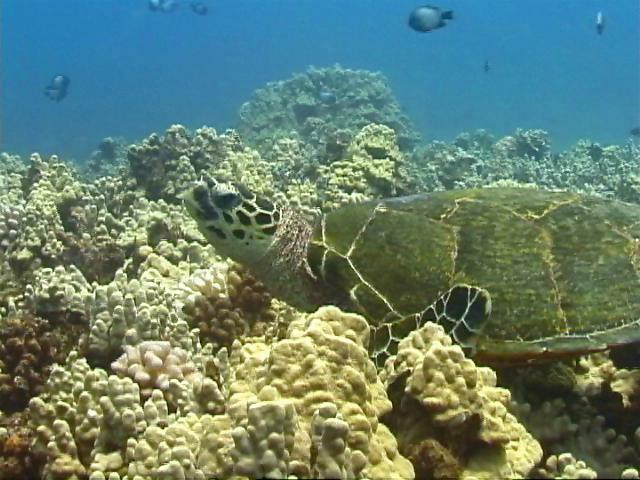 It was a Hawaiian hawksbill. We assumed it was the one sighted by divers at Old Airport Beach. The DC-3 airplane carries the affectionate name "Gooney Bird." Last summer we placed a plaque on East House at Reef 2 to honour the airplane that flew George H. Balazs to the French Frigate Shoals for the first time on June 1st, 1973. When we returned on our first dive we discovered that East House had collapsed! The plaque was no longer visible. We pondered what to do. Well, this week we decided a plaque is of little use if no one can see it. So we performed a "rescue". It was obvious from the beginning something was wrong (it was too easy to pull the plaque loose). Then we realized that all the wood had rotted--more worm holes than wood! We stripped the plastic inscription from its mount and brought it to shore. We realized that all the wood had rotted--more worm holes than wood! We will replace and rededicate the plaque (minus wood) once we find a suitable new site. We discovered that a wooden plaque has the live expectancy of a Brillo pad when immersed in salt water! It was a late afternoon dive with zero current. Sun shining. Perfect. The newest little turtle we sighted this year was having a terrific time swimming about attracting six goldring surgeons. The little guy is about 40 cm long and is as cute and he is teeny. A teeny tiny turtle who now lets us get as close as we want. So a name was in order. We called him Akebono. Akebono lives within sight of Makana, another small turtle roughly 50 cm in length. On this particular afternoon, Makana's universe was also unfolding as it should. 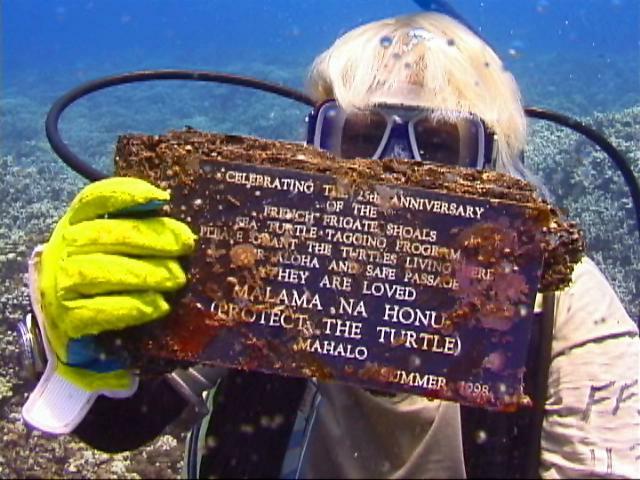 It's obvious honu love "no current" days. For three minutes we watched in rapt fascination as Makana "surfed"--by which we mean she tucked her flippers under her plastron and hung still at twenty-five feet. Makana looked for all the world like she was held there motionless by a string! Then we tried it. Just held our breath and curled ourselves up--motionless, space travellers. It was fun. We suspect Makana was having fun, too. 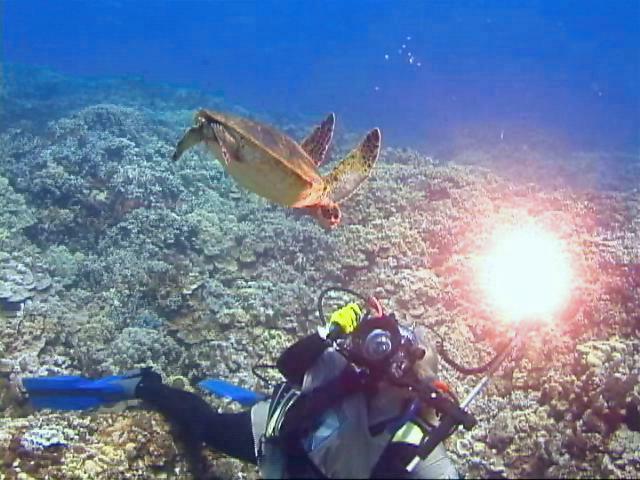 Honu have taught us a great deal. To end off the week, we placed another temperature logger at North House. George Balazs of the National Marine Fisheries Service had kindly sent us one and requested we place it at this new honu location. We placed another temperature logger at North House. We did that on a sunny morning dive. Appropriately, we secured it to Mt. Balazs. 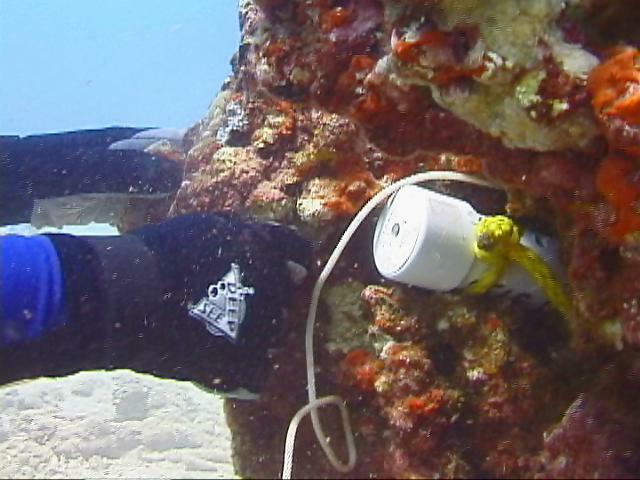 As Peter was tying the logger in place, a honu approached, skated by Ursula, who was videotaping the "event" for posterity, and proceeded to settle at the foot of the coral outcropping. This made Ursula witness to a very odd sight. On one side her husband/dive buddy was tying a monitoring device inside a coral "mount", while underneath, a laidback honu slept. Yes, the turtle fell asleep!